Whether young or old, male or female, alive or forever undead, everyone loves receiving the gift of RiffTrax! What better way to show a friend that you care than by sending them a free Teenage Mutant Ninja Turtles riff, allowing them to enjoy Mike and Co's hilarious commentary? And what better way to show an enemy that you detest them by sending them a free Teenage Mutant Ninja Turtles commentary, thereby forcing them to rent or purchase Teenage Mutant Ninja Turtles? 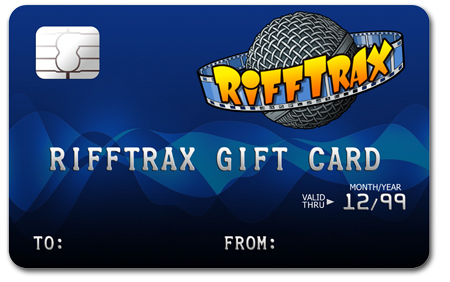 A RiffTrax physical or digital Gift Card is the perfect item for any Riffaholic on your list, and a great way to introduce RiffTrax to those who are Riffaholics but haven't realized it yet. Send yours today! NOTE: These are **Electronic** gift cards that are immediately emailed to your recipient upon Checkout completion. Gift Certificates can be applied towards any item on RiffTrax.com, but cannot be used on purchases made within the RiffTrax App. Looking for a printed gift card? You can find those here.